Despite their cards appearing in green and white, Selesnya, Unstable‘s Crossbreed Labs faction would really be allied with the Simic Combine in the black-bordered multiverse. Their methods are basically the same, although their attitudes and goals might be a little different. Frilled Mystic is, to me, proof that they have more in common than not! To be fair, we did get a hint of this as long ago as Gatecrash with the likes of Shambleshark and Experiment One. Four-mana counterspells with the Instant card type have to be pretty unusual for people to play them in a widespread manner, so why is Frilled Mystic so appealing? As I often say in this space, being a creature adds a lot of appeal just because the most common way for a deck to win is to reduce its opponent’s life total to zero. As such, a creature that can interact with other spell types – or, if you prefer, a spell interaction card that’s also a creature – saves deck slots and puts you ahead on tempo. That’s even more apparent since the Mystic has flash and can be an emergency blocker or end-of-turn play in the absence of dangerous spells to target. In this case, she also has arguably the best creature typeline ever. I’m only partly referring to the rhyme scheme, by the way. Elves are a tribe. Wizards are a tribe. Heck, Lizards might even be a tribe at some point (Metallic Mimic, perhaps?). Once upon a time, there was a creature named Mystic Snake that proved itself to be a dominant force in Invasion-era Standard and even when it got brought back for Time Spiral. The reason I mention Mystic Snake is because Frilled Mystic is basically Mystic Snake 2.0, changing the creature type to one that’s arguably better (and has a better cadence; the long-awaited Lizard Wizard makes its debut) and increasing its power by 1 in exchange for asking for four colored mana. The value in a creature like Frilled Mystic is that you get to leave a creature on board while countering their thing, and it also presents the option to play the creature with nothing to counter. 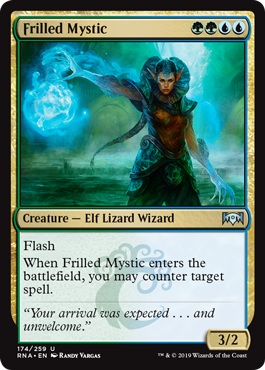 This is not to say Frilled Mystic will usurp more traditional answers; its mana cost is extremely inflexible, and it’s certainly not a guarantee you’ll have the colors you need to cast our Elf Lizard Wizard on turn 4 (or earlier). That said, countering their thing and leaving behind a 3/2 is a large tempo swing, and Frilled Mystic pairs well with anything that allows you to flicker or bounce it to reuse the effect. That mana cost might be a bit of a problem, but expect to see a lot of Frilled Mystic this Standard. It’s one of the “signpost uncommons” for Simic, and it’s apt to put in some work.